You can be excused if you walked into Ireland and thought you had entered paradise. Though it is a small country, it is a land of matchless beauty. Selecting places to visit in Ireland can be a daunting task. We intend to help you out. In our view, these are the tourist hotspots you shouldn’t miss during your trip to Ireland. Want amazing coastal scenery? Welcome to Co Kerry. The Ring of Kerry is the circular drive around Iveragh Peninsula. As you drive round you will have the opportunity to view the breathtaking Atlantic coast, as well as a view of a couple of rural villages. Dublin is Ireland’s capital. Although glossed over, it has many attractive sites to visit. The National Museum of Ireland that contain a lot resources about Irish history and culture. The monumental buildings like the Dublin Castle and St. Patrick’s Cathedral. Not to mention the beautiful parks. Moreover, you can opt to take a bus tour around the city. 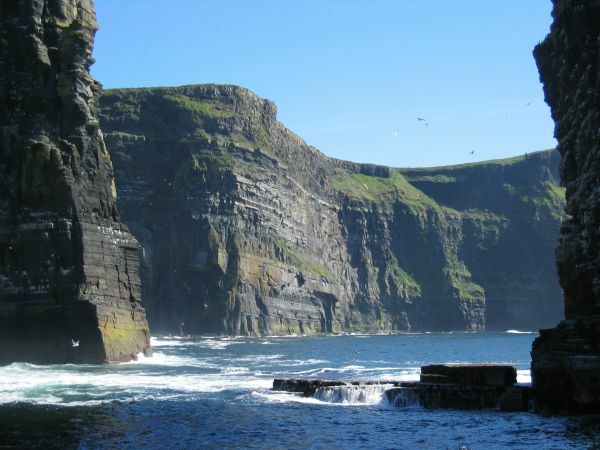 Cliffs of Moher tours are very popular in Ireland. It is a series of huge cliffs 200m high and extending through 8km of land. From the cliffs you have a magnificent view of the Atlantic and serene landscape around. Visitors are also treated to different species of birds which they can watch at different spots. The cliffs are a must visit. Christened the ‘Garden of Ireland’, the valley with two lakes is an epitome of natural beauty. It is also known for its many Christian monuments since it was a place where monks lived. This Co Wicklow wonder is a good visitors destination. The word ‘burren’ in Irish means ‘rocky place’. It is characterized by peculiar rock formations, cracked pavements of limestone, caves and rocky cliffs. When you visit the Cliffs of Moher, don’t leave Co Clare without checking out the Burren. Its stone throw away from River Boyne, County Meath. Irish mythology has it that this archeological complex containing ancient monuments was the seat of the High king of Ireland. These castles of the old still enthrall visitors. The Bunratty Castle in Co Clare, Muckross House in Co Kerry, Ross Castle in Co Kerry, Blarney Castle near Cork and Derryanne House in Co Kerry are some of the popular castles. If history intrigues you, you want to include the monumental castles in your itinerary. It has rightly been described as a geological wonder. It is a stretch of land with forty thousand interlocking basalt stone columns that resulted from a volcanic eruption. If you want to marvel at this sight, travel to County Antrim. This Co Antrim picturesque will not only amaze you will but set your camera running. It consists of nine valleys swooping through the land from Antrim Plateau down to the coast. Furthermore, it has parks and a water fall. Be sure to sample this once you land in Ireland.